All the R-M269 (Group 1) members are indicated by Family Tree DNA as being related at the 37 marker test. A Matrix showing the genetic distances at 37 markers are shown below. With any group of related y-DNA matches, the modal or most common value for each STR is the presumed STR value for the most recent common ancestor (MRCA). This presumes that the matches all generally inherited the y-DNA of the MRCA, except where mutations occurred. 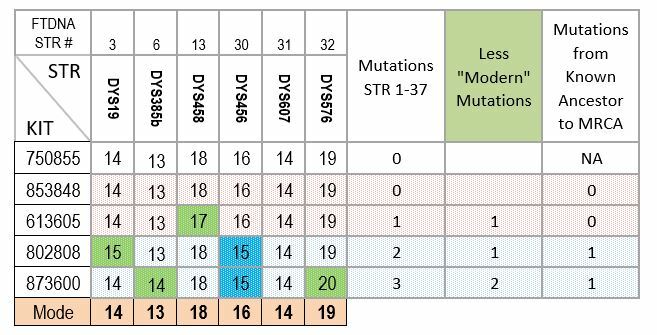 A chart showing these mutations, or differences from the mode, for each member at 37 markers is shown below. 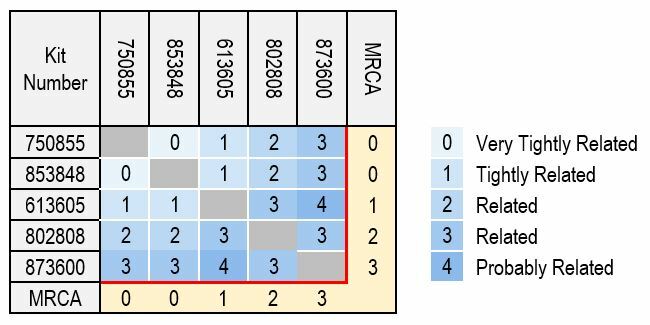 A matrix below shows the genetic distance between each member and the number of mutations of each member to the MRCA. A pair of cousins exist among these members. By comparing the STR mutations of cousins to the modal values, one can tell if a member’s mutations occurred before or after the intermediate ancestor (the ancestor the cousins have in common.) This discussion is below. Some STRs mutate faster than other STRs. If a mutation occurs on one of these markers it may not be an indication of the passage of many generations. Some researchers disregard the fastest mutating STRs when doing analysis In the case of the R-M269 (Group 1) members, none of the mutations occurred on the fasted mutating markers. This analysis implies the possibly these members are very closely related. A hypothetical descendancy tree from the MRCA is shown below. A limitation of this and any y-DNA analysis is that a mutation might occur on an STR several generations back, then at some point that same STR might mutate again and revert back to the original, which would look like no mutation at all. This is not likely, except on markers that mutate quickly. Another complication is that all or the majority of the members of a group of matches might coincidently all have mutations on the same marker at the same value, which would skew the modal value. The larger the group, however, the more remote is this possibility. The following chart is the genetic distance matrix at 37 markers for the R-M269 (Group 1) members of the Ralston Project. This matrix shows that these members are all related or probably related to each other. On the Ralston Project home page, if one selects to view DNA test results, then selects “Colorized Chart”, the resulting chart shows the modal value, “MODE”, for each subgroup in the project. The chart also highlights STR values that differ from this mode. By counting the number of highlighted numbers, one can find their number of mutations since the group’s MRCA. Modal Difference Charts: Following are charts that show all the STRs where each member of the project differs from the modal value, or the STR of the MRCA. For simplification, the STR values where all agree are omitted. The modal values in this analysis were based on an actual mode calculation for each STR using an Excel spreadsheet. Totals are shown for the number of mismatches to the mode or mutations since the MRCA for each group of tested markers. The totals ranch from 0 to 3. “Modern Mutations”, shaded in green, are explained in the section “Cousins” which will follow. There are two sets of suspected cousins in this group. The first set is 853848 and 613605 who have a common ancestor of the early 1800s. Referring back to the modal difference chart, their markers have no common mismatches, and 613605 has one mismatch which 853848 does not have. Therefore, this mismatch was not passed down from their common ancestor. The one mismatch of 613605 occurred after their common ancestor and are what I term “modern mutations.” Their common ancestor was closely related to the MRCA of the group (0 mutations after deducting the “modern mutations”). The other cousins, 802808 and 873600, have a common ancestor from the mid-1700s. They show one mismatch in common, at marker DYS456, so they inherited this mutation from their common ancestor. Both of these cousins had “modern mutations” that occurred after their common ancestor, because where one cousin had a mismatch, the other retained the original value for that marker. Additionally, different STR markers mutate at differing rates. Thus, a mutation on one STR might carry more significance than a mutation on another, since a mutation on a marker that rarely mutates would be an indication of many more generations for the mutation to have occurred. Again, note on the Ralston Project home page, if one selects to view DNA test results, then selects “Colorized Chart”, the STR markers listed across the top are colored. Those with a red background are the fast mutating markers. Several web sites, such as http://adamsfamilydna.com and http://www.taylorfamilygenes.info, have posted tables showing the average mutation rate of each STR. Of the 111 markers tested at FTDNA, the top four fastest mutating markers are CDYa, CDYb, DYS712, and DYS449. Because these markers mutate so quickly, some analysts exclude these markers from their analysis. In the case of the R-M269 (Group 1) members, however, none of the mutations occurred on the fasted mutating markers. The accuracy of these analyses is improved by having as many matches as possible in the group. Having more matching members makes the modal calculation more accurate and offers greater possibilities for determining if intermediate ancestors existed. Additionally, accuracy is improved by having as many as possible testing at 111 markers. Note in the chart that four members show a mutation count of 0 from the MRCA at 37 and 67 markers. However, the two of these four that have tested 111 markers showed mutations in the additional markers. This would also make the modal calculation at the 111 level more accurate. In addition to STR testing there are also benefits to be gained from SNP testing to further narrow a member’s haplogroup. It was already apparent that all the R-M269 (Group 1) members are related, descending from a common ancestor. This analysis supports that and implies the possibly these members are even more closely kin than thought. The most likely scenario for the path to the MRCA is that there are branches with intermediate ancestors, from which closer cousins descend, as in our (at least) two cases. However, if there were many generations between the MRCA and the intermediate ancestor, one would expect mutations to have occurred and been passed down to the end matches. We currently have only one instance of inherited mismatches, between the MRCA and John Ralston, 1761, one mutation. *750855 Pencil’s unknown Ralston ancestor fathered Pencil’s great grandfather Joseph Elmer Pencil in 1865 in Miami County, Ohio. James Henderson Ralston fathered James Moist Ralston in 1862 (ancestor of 853848 Ralston) and David Carlton Ralston in 1872 (ancestor of 613605 Ralston), both in Miami County, Ohio. 750855 Pencil matches 853848 Ralston at 0 genetic distance at 37 and 67 marker levels.